maggie’s AchillesBlog » Quick Recovery IS Possible!!! I am writing this post because I want people to know that it is possible to recover quickly from an Achilles Tendon Rupture. It won’t be easy, it won’t be pain free, but it is possible if you find a doctor who allows you to be aggressive in your recovery and you stay in shape during your non-weight-bearing time. I ruptured my Right Achilles tendon during a flag football game on October 25, 2012. I saw a Doctor the next morning and was in Open Surgery for a full repair October 30th, 2012; prior to surgery I told the doctor to keep the incision as small as possible, and he lived up to his promise. During my recovery I started reading posts about folks with similar injuries being on crutches 8 months post recovery. I knew immediately this would not be acceptable, so here is my story. Let it be noted I am a 31 year old female, living in alone in Chicago on the 3rd floor of a 3 floor walk-up, who has worked out regularly for 18 years, and was off crutches in under 6 weeks. I let myself recover for 5 days after surgery, stayed with a friend for the first 3 nights, and then transferred myself home to sleep, lie on the couch, read and watch bad TV. I took my last pain med November 3rd, 5 days after surgery. November 5th, I got my splint off and my first cast on; from my doctor office, I took a cab downtown and started a new job on November 5, 2012. It is a desk job, so I propped my leg up on a trash can under my desk and went to work taking ibuprofen as necessary. The first week I worked 5 – 7 hours/day and took Wednesday off. If I were to do this again, I would have waited until Wednesday to start and given myself an entire week post surgery. Hindsight is 20/20. My nights and weekends were spent resting. Living up 3 flights of stairs without an elevator, or 42 stairs to be exact, I was lucky to have a large support system of friends as well as live in a city where I could have my groceries delivered and cabs take me to work. I would suggest to anyone going through this recovery to purchase a bench for your shower so you can sit down; it will make your life much easier. The usual happened for the next few weeks, I got 2 more casts as they stretched out my Achilles, pumped myself up enough to go to 2 happy hours – folks are really nice to the lady on crutches – and spent a lot of time resting, elevating my leg and doing daily activities. However, and I feel this made a world of difference, I didn’t lie around for 4 weeks. I came up with 2 – 15 minute exercise routines and did them both twice a week. Mondays and Thursdays I did leg lifts – front, side, back, and core strengthening; Tuesdays and Saturdays I did arm and back strengthening (your posture on crutches is terrible!). I also kept close track of what I ate and dropped 6 pounds to make the upcoming weight bearing easier. 4 weeks post surgery I got my final cast off and my walking boot on. I started Physical Therapy, 3 times a week, immediately. Having someone touch my leg after 4 weeks in a cast was not enjoyable but necessary. The scar massage was uncomfortable for the first 2 weeks, but my 1” scar is barely noticeable (Kudos to my doctor for such a small incision). 5 weeks post surgery I was down to 1 crutch, in my walking boot. Less than 6 weeks post surgery I was off crutches completely and started doing daily activities around the house without my boot for 1 hour each morning and 1 hour each evening. 7.5 weeks post surgery, I was released from my boot and had nearly all movement back in my ankle. I’m at 8.5 weeks post surgery and have no pain and minimal swelling after a long day. I am able to walk (correctly) at 1.5 miles/hr in gym shoes and only wear the boot when I am walking to/from the train – I’m still cautious because there is ice on the ground and I don’t want to reinjure. Per my request, I do twice as many exercises as those with similar injuries in my Physical Therapy practice and started full weight bearing 6 weeks post surgery. I do my Range of Motion exercises every morning and evening from the moment the hard cast was off. I do squats while I brush my teeth, leg lifts while I watch TV and stretches if I’m lying down. If I sound crazy, just ask yourself if you too want to be back to normal as soon as possible, because I do. That’s my story. I can’t run or jump, but I can walk around, boot and crutch free, and got there quickly. I stayed in shape during my recovery, I asked friends for help, and I stayed positive. I am sure I will have setbacks over the next few months, but if you are going through this recovery, you have control over your healing process. Keep a positive attitude, get a silly bench for your shower, allow yourself to recover but push yourself and don’t lie on the couch for weeks on end. Good luck! I love the attitude, Maggie! The exercising is great, too — we should all do ‘em while we brush our teeth etc.! 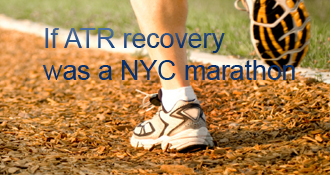 Ironically, your actual rehab protocol could have been weeks faster — e.g. bit.ly/UWOProtocol gave up the crutches at 4 weeks or a couple of days later (”as tolerated”) and got excellent results. They had the advantage of a boot, exercise, and PT all starting at 2 weeks post-whatever, instead of the old-school multiple casts. But getting to the goal line is the key, and your recovery sounds good. Don’t Stop! Thank you for the positive energy! Great to know about the earlier recovery option, but hopefully I will never have to go through this again. Love your attitude Maggie and sounds like your recovery is going great. We are about at the same time 11 weeks, I think? Although, you are probably 2-3 weeks ahead in progress. I’m still in the boot until next week, per my surgeon (I also had an extensive surgery with a 12″ plus incision. I give credit were it is due, and you staying on top of your exercises is amazing, I did something similar everyday (ROM, leg lifts, and Therabands) minus the last week (holiday laziness). Anyway, happy healing it sounds like you are doing great. Watch out for the Winfrey conditions also. I went quickly through the first post surgery phases too. Two shoes at just over 5 weeks. At 7 weeks I was cycling outdoors. At 8 weeks I was hiking in the mountains. At 10 weeks I was skiing. It was great to regain bits of an active lifestyle, and I really think being so active was VERY beneficial in the long run. However, while those were all great milestones to make- in hindsight, I don’t feel like the *real* recovery started until much later… I wasn’t able to really start rebuilding lost strength until 12 or even 16 weeks. And, that recovery process (at 16 months) is still not fully complete. I guess it’s how you define it. If recovery means getting back to doing the things you were doing pre-injury, then yes (depending of course, on WHAT you were doing pre-injury), it’s often possible to “recover” quickly. If recovery means regaining the pre-injury function, strength, endurance, and explosive power of the calf - then the unfortunate truth of this injury is that you can’t (safely) start working the calf muscle effectively, until the (Achilles) tendon through which it acts is near full strength. There’s really very little we can to to accelerate that healing process. By staying active, keeping the joint and muscle engaged - even at some minimal level - I think there is benefit in reducing the severity of the atrophy; so I’m am a big proponent of the approach you’ve taken. kkirk, you’re doing awesome! If you have a 12″ incision I expect your injury and surgery were more involved than mine. Stay safe on the icy sidewalks and roads! And amazing about your recovery milestones! I am just over 8 week post surgery and there is no way I could hike right now. Thanks to everyone for keeping the positive energy coming! I definitely have days where my own pep talks get old, so I appreciate the kind words. Lynn, our injuries may have been different and I’m sure your doctors are in the know on your injury. I walk with a limp, slowly may I add, but am up to 2 miles/hour and able to get up and down stairs (down stairs not as elegantly as up them, but I’ll take it). I have a friend who is an orthopedic surgery and she admits that she leaves her patients in the boot until the 8 week mark as she too is conservative. Every day is a day closer to recovery! Hang in there, you’ll be walking before you know it. I wouldn’t call 8 wks in a boot conservatve (or slow). It’s consistent with bit.ly/UWOProtocol , and very few people here go significantly faster. Lynn, why are you limping when you walk in your boot crutch-less? If your boot fits properly, you should be able to push your knee forward to roll your weight from its heel to its toe, all without using your calf or AT at all. That should produce a normal stride. Why not for you? You do raise an important point about body weight. We tend to talk about various successes — 2-leg and 1-leg heel raises, a non-limping stride barefoot or in shoes — the way we’d talk about pushing with 50 pounds force with our calf-&-AT. But those moves DO take more strength if you weigh more. While we were losing the long-stride “dip”, many of us tested our strength by pushing down on a bathroom scale with the ball of our injured foot. That gives an objective & weight-independent measure of calf and AT strength. It also can show some progress when it seems like there’s none! First time on this site. So much info to take in! Just talked to a surgeon yesterday who recommended debridement surgery. He said 4 wks NWB at a minimum. (yikes!) I know no one has a crystal ball, but I am planning a vacation to Paris mid-June. If I have surgery mid Feb should I change my vacation plans? Obviously it will be a lot of walking. Hi. the reason i am limping in a boot is because i only started partial weight bearing in a boot, with crutches 1 and a half weeks ago. This is was PT’s instructions. I always use the crutches unless i urgently have to use one of my hands to carry something else. When i start physio again next week i will be taught how to walk properly in the boot., hopefully without a limp, i dont want to attempt anything else until my physio says i can…thanks for your feedback and advice…All the best to you as well..
Spizzas, I am only 8 weeks out from debridement so cant say what will be like at 4 months. However, I am already walking in shoes. Only short distance walks at he moment and Not yet ready for Paris like trip. But hope I will be in 2 months. Actually have a trip to Buenos Aires in 8 weeks, so will find out. Thanks for your reply It sounds so daunting but reading this is a light way at the end of the tunnel! I will look forward to reading about your continued progress. Well done maggie, great progress. I am nearly 8 weeks non-op. Been a bit naughty and just done 15 feet in “no shoes” with a horrible flat footed limp (-I should wait until next week when weening off boot begins). But boy did it feel good to stand unaided and feel the ground beneath my feet again ! Next short term goal is to move to 2 shoes next week. My real longer term goal is to be fit enough to play badminton again with my daughters. Wow that’s excellent! were you surgically repaired or not? Anyway setting sensible goals is definitely the way to go. I am 7.5 weeks post op and have been in two shoes since week 6 with heel wedges and crutches, started walking (limping) around the house 3 days after going into trainers now 7 and half weeks on walking and going up and down stairs crutch free (in the house only) Still feel the need for crutches when out and about, uneven pavements and other such hazards! First physio last week mainly ROM exercises and some strenghthening which I aim to do 3-4 times a day, always mindful to ease up if the achilles starts feeling very tight/painful. My next goal is to walk without the limp which I can albeit very tiny steps for short periods, It is very heartening to see the progress you make daily and helps to keep you focused on what a journey us ATR’s are now on. Congrats on the progress. I’m just now switching over to 2-Shoes and 13 weeks. My personal goal is to increase my walking distance / endurance for the next couple of weeks. I’m still not quite up to 1 miles, but I’m close. Happy healing. maggie’s AchillesBlog is proudly powered by WordPress and WPDesigner..